Casa Padrino glass, polycarbonate and acrylic tables and dining tables are stylishly designed and high-quality processed. Welcome to Casa Padrino, the leading online retailer of baroque furniture, antique furniture, luxury furniture, country house furniture and many other furniture styles. But we not only offer furniture and decorative accessories for the ambitious furniture connoisseur, but also convince with a large range of products for the whole family. Because you do not have to be an expert to equip yourself at Casa Padrino with exquisite pieces of furniture and decoration accessories. At Casa Padrino you are guaranteed to find what you are looking for. All items from Casa Padrino we offer for a fair price. Casa Padrino, your specialist dealer for baroque furniture, antique furniture, luxury furniture, country house furniture and many other furniture styles, offers you numerous glass & polycarbonate dining tables in abundance. 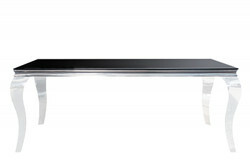 With us you will find phenomenal, noble and pompous glass & polycarbonate dining tables, which fit exactly to you. In addition, we use only the highest quality materials to ensure the highest quality standard for your needs. You will always be able to enjoy a noble and splendid appearance with these glass & polycarbonate dining tables and evoke enthusiasm among your guests. The noble and stately glass & polycarbonate dining tables decorate your home very modern and guarantee to be a real eye-catcher. Your guests will love the glass & polycarbonate dining tables.